TEMPE — On a sweltering spring afternoon, the normally gridlocked roadways are lightly traversed on a weekend afternoon. Jevin Hodge sits in a local coffee shop, a stylish three-piece suit draped over his athletic build, a gold watch adorning his wrist. He orders coffee from the barista, effortlessly starting up a conversation with the woman as if the two had been lifelong friends. “I love people,” Hodge says with a slight grin. He speaks quickly in a soft voice full of purpose, passion, and charisma as he talks about his work in public service. 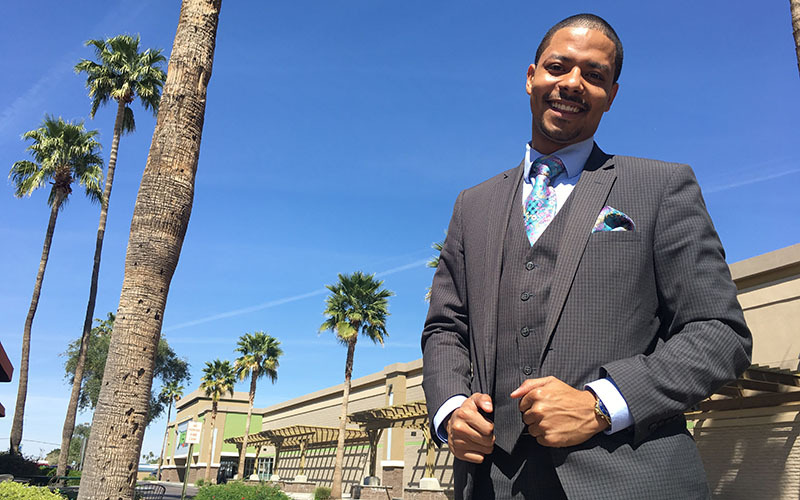 At 23, Hodge said he’s the youngest African American elected official within the Democratic Party organization nationwide and the first African-American millennial to hold the position of vice chairman of the Arizona Democratic Party. His rise to political prominence in Arizona coincides with the Democratic Party winning key races in Maricopa County, even as Democrats lost control of the federal government. Political analysts and democratic activists say Arizona Democrats could be on the pathway to success in the mid-term elections, despite the party losing ground nationwide last November. A new generation of political leaders such as Hodge is leading the way. 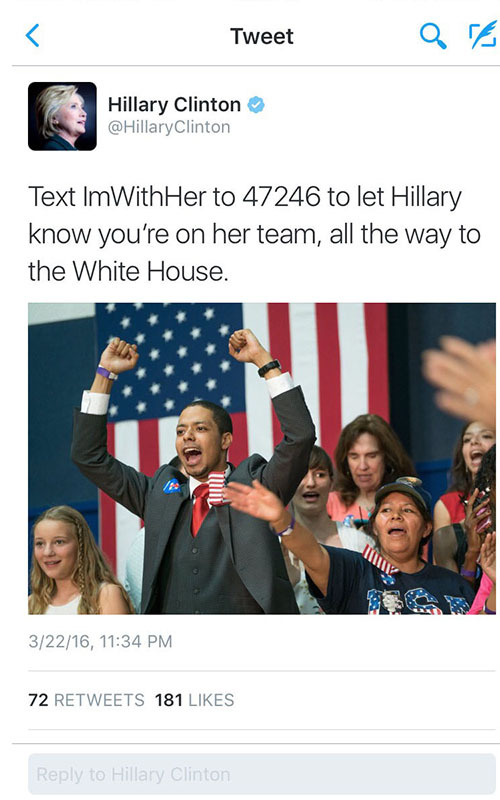 He was born and raised in Tempe by a single mother who is also active in politics. 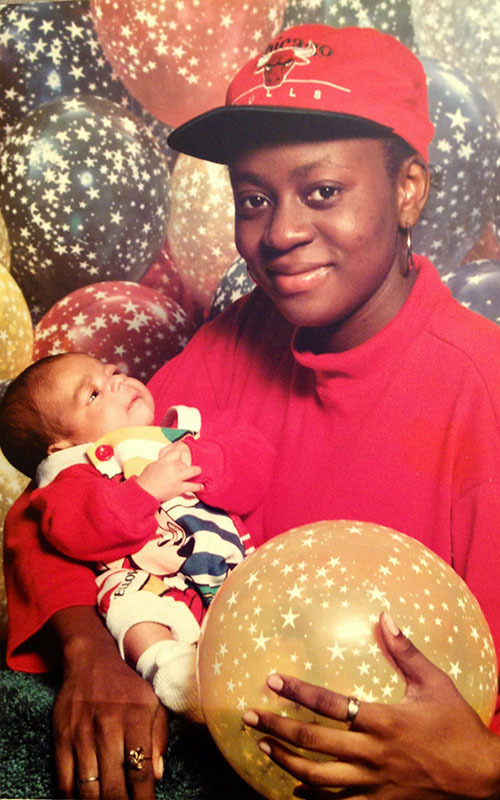 Berdetta Hodge holds her infant son Jevin to pose for a photo. His interest in politics began in childhood. Throughout elementary and middle school, he was involved in a lengthy list of public service projects. This included a 2004 event that he says was the largest student-led school fundraiser in the state, and attracted the attention of CNN, which did a story on Hodge, a fifth grader at the time. “The flame was always lit,” he says. 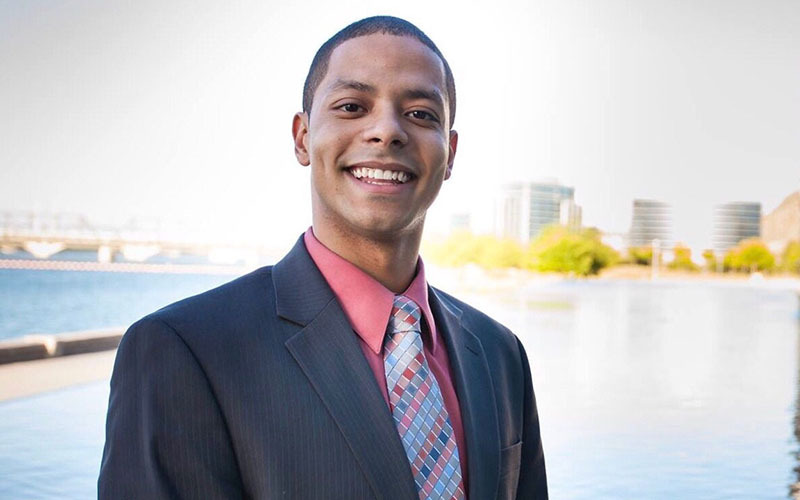 During this time, he also developed a close, mentor-like relationship with Corey Woods, a former city councilman who became vice mayor of Tempe. “I first met Jevin when he was a teenager, probably 15 or 16, and he was involved with the Mayor’s Youth Advisory Commission. He was just a young man who was trying to make a difference, trying to get involved,” Woods recalls. “On a very short term basis, I think that he is doing great work. He is already involved in several different things in the community, school boards, volunteerism, politics. He’s already giving back a lot. “He is going have that level of impact short term, but on a long-term perspective he’s going to have a huge impact I believe, if not countywide, then statewide,” Woods says. During his senior year at McClintock, Hodge wrote and proposed a bill to the Arizona Legislature that incentivized student volunteering by requiring the governor to commend students who accumulated more than 200 hours of service. The bill garnered national attention and was endorsed by then-House minority leader Democrat David Schapira. It made its way through the House and Senate until the bill finally appeared on Gov. Jan Brewer’s desk. Hodge has been a campaign manager more than half a dozen state and local political races in Arizona and in Washington, D.C., including his mother’s successful 2016 campaign for the governing board of the Tempe Union High School District and Veekas Shrivastava’s unsuccessful campaign bid for the TUHSD governing board. He also managed Ed Ableser’s 2012 campaign run for Arizona State Senate as well as Juan Mendez’s and Andrew Sherwood’s campaigns for the state House of Representatives. The Democrats’ inability to connect with working class Americans is one reason they lost ground nationwide during the presidential election, according to Jason Barraza, senior associate director of Veridus, a public affairs and lobbying firm in Arizona. Hodge’s rise coincides with gains made in key offices by Democrats in Maricopa County. Democrat Paul Penzone beat long-time incumbent and hardline conservative Republican Joe Arpaio in the race for Maricopa County Sheriff. Other Democrats such as County Recorder Adrian Fontes replaced Republicans in traditionally conservative Maricopa County. Andrew Wunder, a political consultant and field coordinator for the Penzone campaign, cited the recent victories as a major cause for optimism within the county and state democratic parties. “Penzone won. Adrian Fontes won. This is the reddest major county in the country, so the fact that we picked up two Democratic elected [officials] is pretty massive,” Wunder said. “I think there’s actually more opportunity right now with the Democratic Party than I’ve seen in some time, and I think there’s more opportunity here, especially with (President Donald) Trump being so divisive. “Such divisive politics at the national level, I think, is igniting a lot of people to become active who haven’t previously been active,” Wunder said. Although he is a self-styled moderate, Hodge becomes visibly upset when he discusses education and health care – the two issues he says are most important to him. “If you’re going to include anything, I want you to include this part,” Hodge said. After suffering an abdominal injury playing football, he said he needed to go to the hospital. His mother, in between jobs at the time, had no medical insurance. He said he was left in the emergency room with an IV in his arm – overnight. “The doctor came down and did the surgery that was needed and they sent me home, no follow-up, no nothing, just sent me home. We got medical bills up to the hoo-hah after that,” Hodge said. That experience, as well as a family history of medical issues, led to Hodge’s support for affordable, universal health care. Hodge’s uncle has cerebral palsy and has needed 17 surgeries over the years. “There’s no reason why we should be making money off of people’s lives. Our health care needs to be free, or as close to free as possible for all people,” Hodge said before producing an inhaler from his pocket. He explained that he has severe asthma, but under former President Barack Obama’s Affordable Care Act, his inhaler, which costs $300, is available to him for $27. “We are killing our people because we want to make money and that is not fair and that is wrong,” he said. Hodge described his educational skills as “lacking” when he arrived at George Washington University because of what he says is a “subpar” public school system in Arizona. “I was incredibly behind when I got to college,” Hodge said. “I am the product of public schools, 100 percent. We don’t need to treat all students equally; we need to treat all students equitably. According to Wunder, the Democratic Party in Arizona needs to consolidate the different “bubbles” or interest groups that are narrowly focused on particular issues. These include anti-gun legislation, immigration, health care, and so on. Young democratic leaders such as Hodge, whose mother described her son as wanting to bring “our country back together,” are primed to build a more inclusive party moving forward. Hodge is coy about his immediate political ambitions, but his mother said her son’s political future is in his home state. While he may not be ready to announce any plans, his long-term ambitions roll off his tongue confidently, and with little hesitation. “My dream is to be governor of Arizona. The first African-American, youngest governor of Arizona,” Hodge says proudly. “People are scared, they’re worried, they’re frustrated, they’re angry,” Hodge said before uttering a striking phrase that highlights the stark ideological contrast between a young politician like himself and leaders of old.